These will be useful to introduce students, journalists, or yourself to the concepts of data visualization. Bonus: There’s an interesting discussion on Quora about the difference between information graphics and data visualization. (1) When the Data Struts Its Stuff (April 2, 2011): A 1,000-word article that covers a lot of non-journalism work in this field, including the marvelous Gapminder World. (2) 7 Things You Should Know About Data Visualization: This two-page PDF from EduCause provides a text-only explanation. Representing large amounts of disparate information in a visual form often allows you to see patterns that would otherwise be buried in vast, unconnected data sets. … Visualizations allow you to understand and process enormous amounts of information quickly because it is all represented in a single image or animation. (3) FlowingData: This blog by Nathan Yau, a statistics scholar, is a wonderful resource, frequently updated with great examples from all kinds of sources. (4) Visualization Options Available in Many Eyes: Part of the “Many Eyes” site from IBM Research, this list links to examples of every kind of information chart and graphic you can create with the Many Eyes application. You get an illustration and a clear, brief explanation — great for teaching. See an example: Bubble Chart Guide. (5) VisualJournalism: A great blog that’s focused on information graphics and journalism, published by Gert K. Nielsen, a longtime news graphics editor in Denmark. (6) Journalism in the Age of Data: A Video Report on Data Visualization by Geoff McGhee: Interviews with data graphics experts, including journalists and non-journalists. The package includes a large collection of linked resources, cleverly keyed to the videos, which are split into manageable short chapters. Geoff has been a journalist at The New York Times, ABCNews.com, and Le Monde Interactif. (7) Datavisualization.ch: Another excellent blog devoted to the topic, and also a great source of recent examples. The authors are engineers and interaction designers at Interactive Things, a design and technology studio in Switzerland. 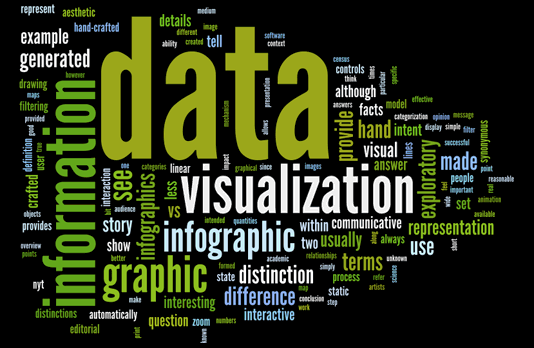 (8) 10 Awesome Free Tools to Make Infographics: Time to get your hands dirty! This useful blog post (from October 2010) also offers advice on how to make an information graphic. (9) Research: How to Tell Stories with Data? This blog post at Information Aesthetics (yet another fine blog about data graphics) summarizes a groundbreaking article (How Do People Tell Stories Through Interactive Visualization?) written by two Stanford University researchers in 2010. (10) A Practical Guide to Designing with Data: A new book by Brian Suda provides a gentle introduction — suitable for journalism students. It’s not high-end theory like the work of Edward Tufte, but the explanations are really well suited to people without a background in statistics or graphic design. Know about a good resource I missed? Please add it in the comments! Mindy – a lovely collection and a great resource, many thanks for sharing it, I know I’ll make great use of it as I dive deeper into my new “open data” beat. However, as an aside, I must admit to some despair as increasingly it looks as though only a very few newsrooms will be able to afford the kind of specialization needed to produce quality work in this field… I wonder if there might not be a great opportunity for a skilled data journalist/artist to syndicate their work. Is anyone doing that? Thanks very much for the link, Mirko! Bill – Great question, and I do not know of any such service. In the past the AP and AFP have syndicated a variety of data graphics. Sometimes I come across them online, but I think they come with a built-in expiration date. So then they soon disappear.